Irv Rothman is President and CEO of HP Financial Services. At HP Financial Services, Irv overseas a multi-billion-dollar global operation. He is responsible for the worldwide delivery of customized leasing, financing, and financial asset management solutions that help simplify customers’ IT life-cycle management and reduce their total cost ownership. Before joining HP, Irv was president and CEO of Compaq Financial Services Corporation (CFS) and a group president of AT&T Capital Corporation. Irv grew Compaq Financial Services into a $3.7 billion business. 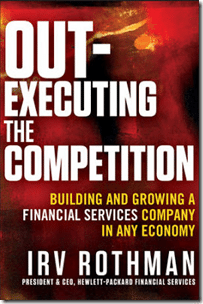 Irv is also the author of Out-Executing the Competition: Building and Growing a Financial Services Company in Any Economy. He’s filled the book with leadership techniques he has used to help companies not only survive financial uncertainty, but to thrive in any economy. 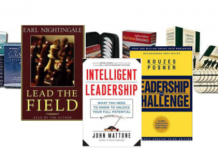 I’m a fan of learning executive thinking skills and applying business skills to life. In this interview, I ask Irv questions about work and life, with a focus on how to win in any economy, and how to apply his best leadership lessons to our personal lives. My purpose has evolved over time. I’ve always considered myself to be a “builder” of organizations; be they start ups, mergers or turn-arounds, it was always about winning in the marketplace we competed in. Now, in what is likely my last leadership role, it’s about ensuring the company is in a position to continue to succeed and providing our people with an enriching professional and personal experience. Making money is hard. So, whether you are running a small company of 5 people or a big company such as ours, the common denominator is leading a profitable enterprise and achieving the objectives you’ve committed to. Beginning with my first leadership job in 1981, I’ve been fortunate enough to be able to do that pretty consistently and steadily was given increased responsibility. My five year stint as a CFO was great prep as well. It was hardly a meteoric rise through the ranks. 3. What is “a day in the life of a CEO” and how do you manage it effectively? We operate all over the world, so, my day starts in my home office at 5 am. Then it’s off to the gym and afterwards to the office for a day of meetings and phone calls. Occasionally, the day can get pretty long if a phone meeting with our Asia / Pacific region is on the schedule. We usually don’t start those until around 7 pm Eastern time. Overseas trips are hectic with all kinds of meetings, customers included, and the work at home continues as well. I don’t seem to have difficulty keeping my arms around things. 4. What is the most surprising insight you’ve learned in out-executing the competition? That it is not price. The creation of and execution on a genuine value proposition is the true source of sustainable competitive advantage and the best chance of retaining a customer for life…which should be an imperative. 5. What role does HP Financial Services play in driving successful adoption of HP Services and Technologies? HP Financial Services (HPFS) is an important differentiator for HP. We serve as the bridge between technology and finance thus enabling customers in the achievement of their business goals. 6. How do you balance investments in the business that deliver near term results while building longer term capabilities? It is rare that we consider investments looking for short term results. Each year, we create an expense envelope that incorporates what we need to spend to achieve our business plan coupled with investments tied to our strategy which, by definition, is longer term. 7. What are the criteria you use to decide what programs and assets to invest in versus those you don’t? Is it tied to our strategic intent? Will it enhance our competitive position? Does it meet our threshold criteria for profitability? What trade-offs are necessary? 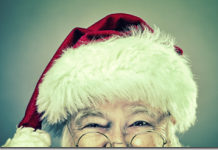 Does the worst case scenario still make sense from a risk standpoint? Can we execute on it? Have we pressure tested the assumptions? Have we avoided simply ‘falling in love’ with an idea? 8. What is your principles for successfully driving the strategy > planning > execution cycle? For us it is all one and the same, not a cycle. ‘Planning season’ is year round and we use the current year’s business plan as the key metric to evaluate performance and course correct, if necessary, every month. Our CFO and I conduct monthly business reviews of every profit center. 9. What future financial services industry scenarios to you see having a transformative effect on the IT industry? Of these, which of these are near term versus longer view scenarios? The future of classical financial services is a little fuzzy right now with possible accounting changes on the horizon and interest rate levels as low as they are. 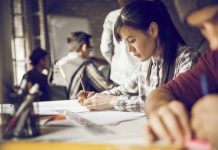 But if you consider transformation to the cloud, which is the most widely discussed (and not very well understood) initiative, it’s almost impossible to contemplate without an enabling integrated financial / asset management solution. 10. How can a person apply lessons from the financial industry to their persona life? Remain true to your values despite the challenges of social and corporate change is essential for success.